From Betty's RV Park, Abbeville, Louisiana On Thursday evening, December 3rd, Wayne and I went to early dinner at Dupuy's Steak and Seafood house just before the Downtown Abbeville Christmas Stroll. 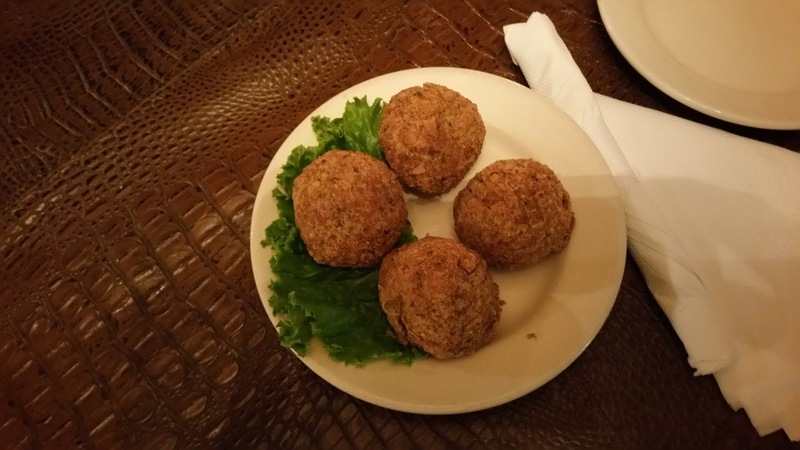 We had an amazingly good dinner that started with four luscious boudin balls. I forgot the names of the entree items we ordered but both were simply delicious and filled with delectable crawfish. At Dupuy's. Notice the beautiful display of oyster shells along the wall near the ceiling. All were polished with glittering edges. As we were finishing dinner and about to have dessert, Pam, Ernie, Joyce and Charlie stopped by for drinks. We are all headed out this very cold night for the annual Abbeville Christmas stroll. The tiny town square is sprinkled with lights and it feels like everyone in town is out among us. I whispered into Santa's ear that I'm perfectly happy with life this year. No presents needed. We strolled the streets, listening to Christmas music. One store was specifically Christmas decoration with a large Santa Clause figure at the door. 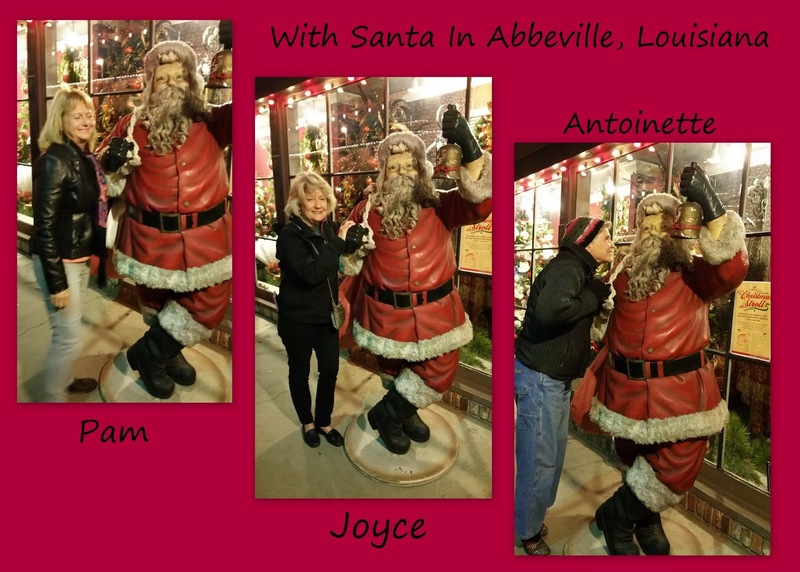 Naturally, Joyce, Pam and I posed with Santa. 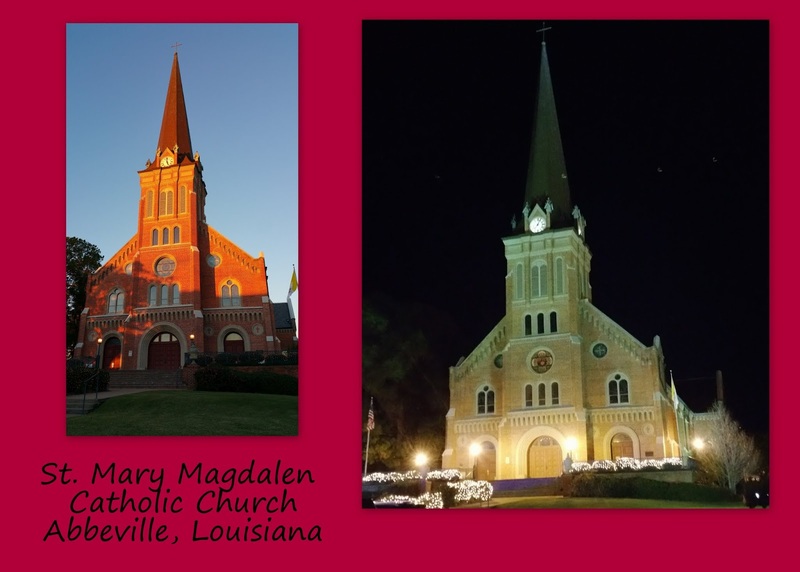 One of Abbeville's landmarks is St. Mary Magdalen Catholic Church which was particularly beautiful dressed in white lights. I took a late afternoon photo and then another during the Christmas stroll. 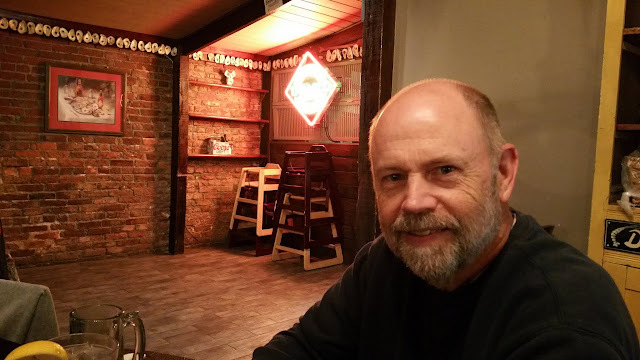 All in all, the cold temperatures didn't bother us and we had a nice night, until as we were about to leave, Joyce stepped down onto something on the city curb that made her lose her balance and fall. Fortunately, she was uninjured except for some soreness the next day.